Did I Really Just See That??!! I haven’t written in a while and I feel like whenever I don’t write for a couple of weeks, I must give an explanation. I love writing the blog and I like making it punctual for you all, so usually when I haven’t written it means something exciting is happening that has made me put off writing. So let me explain myself. Excuse Number 1—I went to Perú for a week. It was one of the most amazing trips I’ve had while down here and was truly an experience to get to know this country. 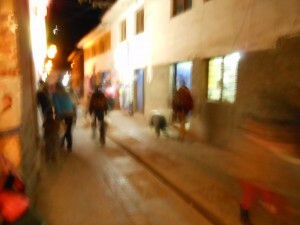 Excuse Number 2—When I returned from Perú, everyone from my program was preparing to leave. With everyone finished with classes, our program had come to an end and so I took the last couple of days to enjoy them with the friends I had made here and that were returning to the States. Excuse Number 3—I had a bit of a personal crisis. I didn’t leave Chile with the rest of my program because I decided that I wanted to stay down here and volunteer for a month. Finding a volunteer program, I started working and had my whole schedule set for the month. Then very abruptly I received an email last Friday informing me that I could no longer work with this organization because they didn’t have any space for me. A little shell shocked, I’ve been frantically trying to find other things I can do for my month down here. I don’t want to go into a lot of detail with this whole “mini crisis”. Although still not solved, I know it is something I will grow from and I will update you all on how it resolves itself. 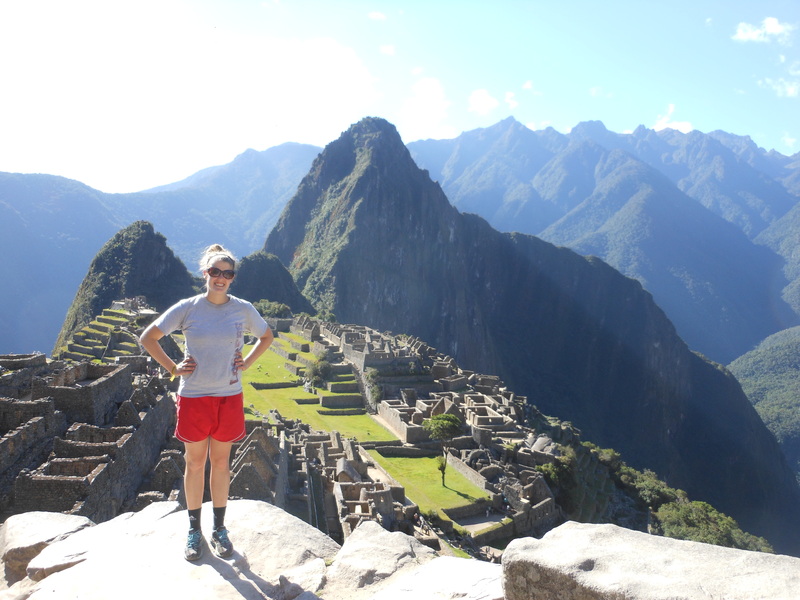 Now that I’ve given you all a quick update on life, I want to tell you all more about my trip to Perú. There is so much I can say about this trip. This country was so different than Chile, it really shocked me at first. I had been to Argentina and traveled around Chile, but nothing could really prepare me for this. However that being said, I loved how different Peru was from Chile. 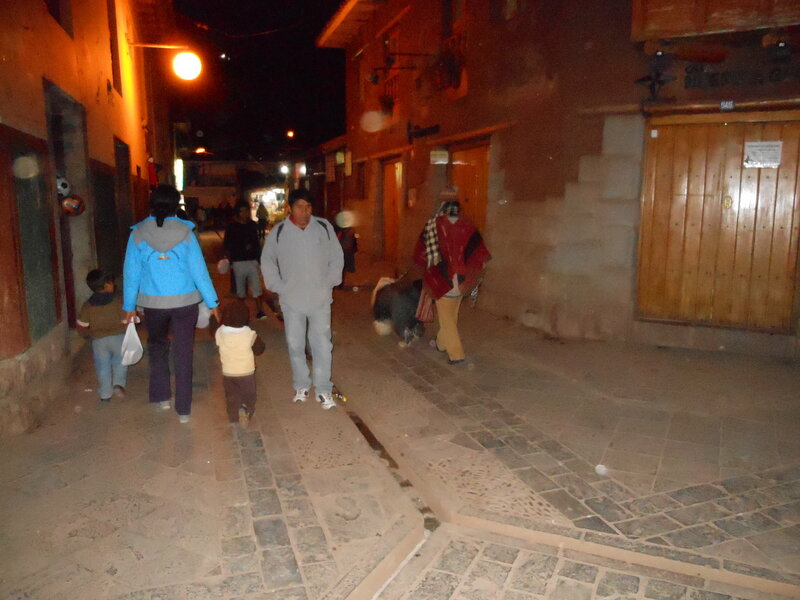 I loved that you could really see the indigenous roots of the people even in a big city, like Cusco, and that everything was so colorful and antique looking. From the cobblestone streets where little old ladies would sell their scarves they had just weaved in front of you, to the small children running around in brightly colored dresses and coats, this country was truly an experience. For the entire 6 days we were there, we visited countless sets of ruins. We traveled through the Sacred Valley to visit Macchu Pichu (a must have if you’re going to Peru) and also visited other less known ruins that were just as breathtaking. I could talk for hours about the amazing sites we saw and how much fun it was each day to climb to the top of a mountain and take in the amazing 800-year-old ruins before us. My mind was literally blown everyday by the Incan Empire and how much we can still see of it. I learned a lot and it made me want to learn more about the history of Peru. But when I think back on this trip, there is one moment that really captures my heart. I’m sure most of you will laugh when I tell this story and it will seem so juvenile of me, someone traveling the world, to say this is the moment that they will remember forever in Peru. But this is how we work, I work, the mind works. We remember those corky moments that made us laugh and for some reason or another our heart swelled with happiness so much that we could burst. That’s how I felt when this happened and so I want to tell it to all of you, no matter how corny it may seem. It was early evening and me and the two girls I had traveled with to Peru had just grabbed a quick dinner off a taco stand in a small town in the Sacred Valley called Pisac. We had spent the day here and after a long 5-hour hike up the mountain, we were all exhausted and ready to eat. (I have to say that the tacos from this stand were literally the best tacos I’ve ever had in my life and I highly recommend people stop in this town simply for these tacos.) Taco in hand, I was walking to the bench where my two friends where eating, when out of nowhere a big furry white and black dog walks by, attached to a leash that is in the hand of a Peruvian man dressed in a red poncho. I started to freak out. There was no doubt in my mind that that dog was an Old English Sheepdog. Perfectly groomed, he looked like he was straight out of a kennel club magazine. Now this may not seem like much to any of you, but I had Old English Sheepdogs growing up and they are absolutely the coolest dogs out there (I may be a little biased). Not only that, but these dogs are rare to see in the States, especially groomed well. To put it in a little perspective, I see about one Old English Sheepdog about every 2 years in the States and out of these, I can count on one hand the amount that I have seem well groomed like this dog was. But here I was in this tiny town in Peru, seeing a perfectly groomed Old English Sheepdog walk down the street. WHAT!!! ???? The first shot of the Old English Sheepdog. I was frantically running while taking this shot, that’s why its a little blurry. “Get a camera, get a camera!” I nearly shouted, knowing I had to document this moment. I quickly realized that I had a camera in my pocket. Shoving my plate of tacos at my friend, I whipped the camera out of my pocket and started rushing down the street that the dog was half way down now. I frantically snapped some shots, but because I was running and it was dark, I couldn’t say they were of high quality. I felt accomplished though. 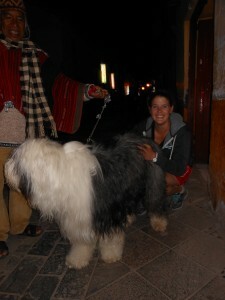 I had documented the moment and I could prove to everyone that I had seen an Old English Sheepdog in Peru. I sat down with my tacos, giddy at what I had just witnessed. I kept saying “Wow! Wow! Did that just happen?” I couldn’t believe it. Had I really seen that? It seemed so unreal to be true. Another shot I took the first glance I got of the dog. I had stopped at this point and got a little clearer picture. I turned to my friends after a few minutes of gushing over the crazy sight I had just saw, saying, “You know what would be cool? If he came back. Then I would really know it was real.” About a minute later, I see the same dog turn the corner and walk right towards us!!!! No way! This was too real now. I wasted no time this go around. I took my camera, pulled my friend by the arm to come with me, and told her she was going to take a picture with me and the dog. Again, chasing the owner half way down the street, I tried to catch his attention. He finally turned around and I asked what type of dog he had, fully knowing what breed it was. When he responded that it was Old English Sheepdog, I explained that I had this kind of dog growing up and it was so strange to see this breed in South America. I asked to have a picture. He laughed and said yes. Right after I asked to have a picture with the dog. I was so giddy and happy I couldn’t even focus when my friend said she was taking the picture. After snapping some photos, I said thanks, petted the dog one last time and then headed back down the street. That was the best moment of my life, I thought as I walked away. This was the last night of our trip in Peru and although I had seen some pretty amazing things—one of the 7 wonders of the World, for goodness sake, Macchu Pichu—this was definitely the highlight of the trip. Seeing not only an Old English Sheepdog in South America, but one that was perfectly groomed, as if it could walk into a dog show at just that moment, was absolutely incredible and topped every ruin we had seen. To put this into perspective for you all, one of my good Chilean friends told me that people in Chile don’t buy their dogs from pet stores, they simply grab them off the street if their kids ask for one for Christmas. This means that pretty much all the dogs here are mixes, not full-bred poodles or Labradors. And this is in Chile, a much more developed country than Peru, meaning that it is even more strange and rare to see such a superbly bred dog here. REALLY??!!! And I had seen maybe the ONLY well bred and groomed dog in the entire country. No joke. It could be. This experience was one for the record books. 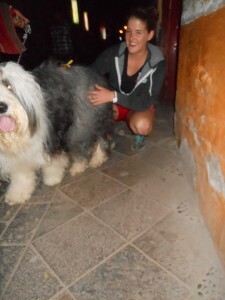 I can honestly say I don’t think I will ever see that again—an Old English Sheepdog in South America. The final shot. Literally the best moment of my life. One of the highlights of studying abroad. It’s the little moments that count.